This blog post tells about a day trip to Central Bali. We rented a car and a driver to see the artist villages of Batubulan and Batuan. In the villages we visited a jewellery, a painter house and the famous Pura Desa Batuan temple. Before heading to the mountains and the volcano of Mount Batur we stopped at the ancient Goa Gajah Elephant Cave. To be able to make the trip we rented a car and a driver. How we did that and what driving in Bali is like is explained in my other blog post Day Trip to West Bali. The day trip to Central Bali will continue in my next blog post where I will tell you about the return trip. We took another road back from Mount Batur and learned about Bali coffee on a coffee plantation and walked on Tegallalang rice terraces. The map shows the driving route of this blog post. We started at Sanur where we stayed in Bali. The return route will be on the next post. Right after we left Sanur we began to see statues, statues and even more statues on the roadside. Batubulan is the next village. It’s a traditional art village and famous for its artwork in all Indonesia. Stone carving is the main craft and sculptures literally fill the roadsides all the way through the village. They say everybody here is very handy and talented in some kind of artwork. Not only statues but also carved teak wood furnishings are produced all over Batubulan. Batubulan is also famous for another kind of art: Barong Dance performances (Barong and Kris Dance). Barong dance is performed at five different Barong stages. You can read about that in my other blog post Day Trip to West Bali. Driving in Bali is fun. The roads are very small but they are good and always surfaced. This village has Indonesian flags on both sides of the road after Independence day celebrations on 17 August. This year there had been a major celebration since it was the 70 years anniversary of the country. Indonesia gained independence in 1945. Flags are kept a week after the celebration. The next village is Batuan. Batuan is a painting center known for its artwork and its special style of painting that originated in the 1930s and has since developed into a major Balinese artistic style. The style is known as Batuan painting. Traditional Batuan paintings are often dark, carefully detailed representations of themes from daily life. Lots of spooks, witches and animal monsters are added. We first visited a jewellery and then a went to see a painter house. Our driver wanted to show us a painter house that also was a private house open to the public. What was a Balinese house like? Just like all houses in Bali the house gate was guarded by statues on both sides. The house didn’t look big from the outside so we were surprised when we got in. Like each Hindu house this house has a family temple to pray. The private temple for ceremonies is in the centre of the house. There are decorated Maru towers and an offering place with yellow frangipani flowers spread on the ground. Frangipani trees grow all over Bali. They have either yellow or red flowers. The yellow ones are dried on the ground and the red ones are used for offering. They put them in small offering baskets called canang sari with rice, leaves, grass and other flowers. Balinese offer to their Gods three times a day. Offering is an important part of daily life. It means sharing and it’s a sign of gratitude. You can see these small baskets everywhere in temples and on sidewalks. In a Balinese house the rooms are in separate buildings with open space in between. This is a good solution in this kind of climate. There are certain rules in planning a house. The kitchen’s place is south. In the painter house the kitchen was very basic and laundry was done in the street which you can see in the middle picture. The temple is located north east and bedrooms for adults in the north and for younger generations in the west. All generations normally live in the same house. The youngest son gets the house and the older couple moves to the side building. As this was an artist’s house there were lots of paintings everywhere. Balinese love strong colors in the paintings but also old traditional black and white Batuan paintings are still made. It takes a long time to make a traditional Batuan painting, normally about four months. In one of the pictures above you can see a painter at work. After the house owner had told us about the house and their daily life we left the painter house and continued our day trip to Central Bali to the village center of Batuan. 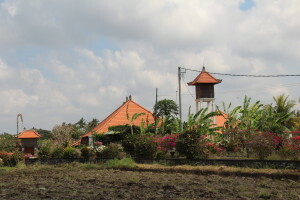 Every village center in Bali has a village temple. They are called pura desa. We visited the pura desa temple of Batuan. Pura Desa Puseh Batuan has a long history. It was founded in the year 1020. As Batuan is an artist village the temple is very beautiful and artistic. The huge, carved entrance gate is a typical split gate. You can see it below. All temples in Bali we visited required both women and men a sarong to be tied around the waist, and there was always one for hire around the area. After we had seen the Pura Desa Puseh Batuan temple we headed north. It was all the time villages. Four Million people live in Bali and most of them live in the area south of the mountains. Now and then you can see open rice fields, and then comes the next village with temples and hundreds of statues. Rice straws are burnt to fertilize the fields. We took a small side road to the jungle to visit a waterfall near Ubud. There was a cafe where you parked the car and you could walk in the rainforest to the waterfall. Like everywhere in Bali they took paid for parking the car. There were lots of tourists around and some souvenir stalls. Children playing on the road, goose families slowly crossing the road, young families on a scooter, school children in their school uniforms, and lov´cal shops and vendors almost on the road. This is the kind of Bali village life we met all over. Here again are flags that still remain after independence day celebrations. What you also can see here are penjor decorations that every house in Bali prepares for a Hindu ceremony in July. Penjors are made according to traditions of bamboo and many other materials are added . They are held on the roadside a long time after the celebrations. Goa Gajah Elephant Cave is a mysterious archaeological Hindu site from the 11th century. The cave facade is a relief of demons and other strange creatures carved right into the rock around the cave entrance. The Goa Gajah Elephant Cave is on the UNESCO World Heritage list. In addition to the Elephant Cave there are ancient bathing pools and some fountains. One of the pools has seven statues holding vases that work as waterspouts. The cave in itself is not big. It is shallow and dark and almost black from the inside. At one end there are three stone idols in black, red and yellow and clothes, and at the other end an elephant statue. More information and pictures on Goa Gajah. The road higher up was in construction and there was dark dust everywhere. The ground is dark since the area is volcanic. We didn’t stop in the villages except in this place where the piled fruits looked so good that we stopped to taste some. Once again we tried to count all the zeros on Indonesian bills. The currency is not the easiest since everything costs either thousands, hundreds of thousands or millions. The fruits we bought tasted so good and fresh – but they were SO EXPENSIVE. I think we finally paid 8 euros for a handful of oranges and plums. You should always ask the price before you buy… But never mind, maybe they need the money for their living. This is Kintamani village on the western edge of the caldera of Mount Batur, right in the middle of the Bali island. Mount Batur is an active volcano. There are two calderas one of which contains a lake, Danau Batur. The first eruption known for sure was in 1804 and there have been many more since then. Lake Danau Batur provides Bali with drinking water. Kintamani has a magnificent panorama of Mount Batur and the lake. It’s very touristic and they are trying to sell you everything but this is also a local market where among other things dogs are sold. The air is cool up here, and I think people in the mountains look different from people lower down. In these altitudes they have got adapted to a climate that is much harder than it is elsewhere in the tropics. Mount Batur is 1717 m high. There are 15 villages in this area and a famous temple Pula Ulun Danu Batur a bit further along the road. If you stay here you can trek to Mount Batur. But we were just on a day trip and turned back. On the way down we visited a coffee plantation and a Hindu temple and walked on rice terraces. You can read about that in my next blog post on Central Bali.